Image by Strebe. Public domain. Via Wikimedia Commons. It feels like a lifetime ago, but it’s only been about thirteen years. Really not very long for a hobbit. While many people let September the 22nd pass by without any thought, it’s always meaningful for me. Back in college, it was one of the biggest events in my first online family. I’m talking, of course, about Elendor, the MUSH where, virtually anyway, my husband and I met in March of 2000. When September 22 came around on Elendor, it was A Very Big Deal. Frodo and Bilbo’s Birthday was one of the highlights of every game year, where we gathered and celebrated and role-played until our fingers went numb, writing scenes late into the night. It is the day, of course, that dear Bilbo left the Shire and bequeathed that curious ring to Frodo. It is where Frodo’s adventures start and Bilbo’s come to an end. For Ringers both online and in the real world, that’s beyond meaningful, especially those with a proclivity toward the hobbit set. Unlike so much of Tolkien’s world which feels so immense and sweeping, the comforts and celebrations of the hobbits of the Shire feel so much more familiar. Every year I mark the day, but this year it’s a two day festivity, as they’re celebrating the 75th anniversary of Tolkien’s first Middle Earth novel The Hobbit on the 21st along with the usual festivities. I’ve got say it’s set me to thinking quite a bit about what that means exactly, and what it will mean to my kids. I was fourteen when I found The Two Towers in my school library and started reading. Even though I had no idea what was going on due to a tremendous lack of context, I was able to piece the story together from watching the Rankin Bass versions of The Hobbit and The Return of the King . (I will admit that I had no idea what sort of creature an “Aragorn” was and, upon my first reading, imagined him as some sort of green forest creature, what with all the sneaking.) 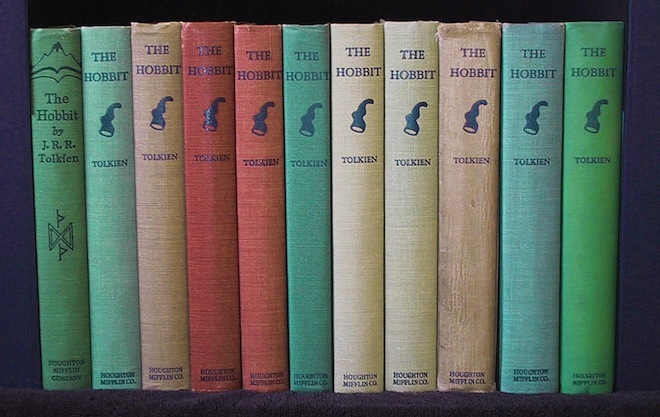 My life was quickly consumed by this man Tolkien’s creation, and I realized that there were people in the world who had read these books and those who did not–I came to realize I did not want to associate with the latter because, clearly, they were missing The Most Important Thing Ever. Image by Natania Barron. 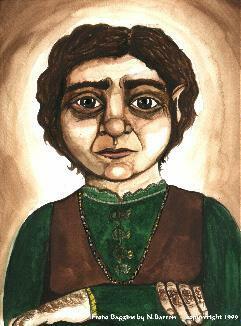 A portrait of Frodo I painted in watercolor when I was 18 and extremely hobbit-minded. And of course, because of Tolkien I met my husband, and by extension, had two children. It’s an odd burden to carry around, and something that, in spite of my grown up opinions about Tolkien’s work as a writer (and a man of his own opinions–I used to think I’d like to have tea with him, but somehow I think we’d disagree on too much now) is no less dear. Yes, unlike most parents, someday I’m going to have to explain all this to my children. How this Englishman with a thing for trees and the comforts of home fits into our own lives and their own existence. I’ve thought of saying things like, “Technically your father and I were married as hobbits before we even started dating”–you know, just to get the conversation started. But it’s a lot to consider. Tolkien is a big deal in this family. And maybe that’s why I’ve waited and why I have so much trepidation as to exactly how and when to share Tolkien. My daughter’s far too young, but our son Liam is quickly becoming of the age where hobbits will matter. Where stories will be as bright to his imagination as they ever will be, as he enters into that precious time where he will start to carve out his own identity. Of course, with the movies coming out soon, my son won’t have a hard time jumping into the fandom if he wants. But I think–no, I know–we first must read the book. There’s a chance he’ll skip the trilogy, but The Hobbit , especially at his age, really needs to be experienced first. I don’t want his first foray into Middle Earth to be through someone else’s lens, or a Lego kit, or a Happy Meal*. Maybe it’s harder. Maybe it’s longer. Maybe he’ll have more questions. That’s fine. It’s a simpler, finer thing. And isn’t that what the spirit of The Hobbit is all about? So this year, we’ll do the simple thing. We’ll get some English cheeses. We’ll buy some good, tasty ale (ginger for the geeklet, and the real stuff for us). We’ll put the fire on and open up the book, and begin. Because, ultimately, it’s not just Bilbo’s story that starts in those pages. It’s all of ours, too. * Yes, my first vision of Middle Earth was via Rankin Bass. And it took me years to envision hobbits and Gollum differently–I seriously don’t want him to have to undo that kind of damage, either!